This is not a drive by. You must truly see inside to appreciate the recent upgrades! There are new granite counter tops in the kitchen and both baths. The kitchen has travertine tile flooring and stainless steel appliances. The sunken living room has a vaulted open beam wood ceiling and new energy efficient gas burning fireplace with raised hearth and custom Adelaida stone surround. There are new double entry doors with leaded glass and travertine tile entry floor. The master bath has new stone shower walls, a large ceiling shower head and glass block enclosure. There are duel pane vinyl windows, upgraded ceiling fans throughout and a solar electric system. A huge addition to the original 2 car garage making the garage approximately 1100 sqft according to seller and allows room for up to 4 cars or a boat with plenty of space for a big workshop. The garage addition has an over sized front entry door plus a rear roll-up door for backyard access. 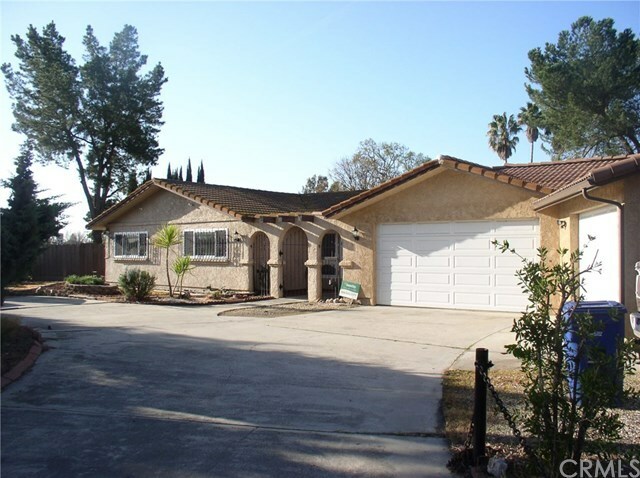 The property is on a 1/3 acre lot that backs up to the Paso Robles Golf Club Course. The backyard is private and includes raised garden planter boxes, fruit trees and covered patio with spa for outdoor enjoyment.